Can this connection between Credence and Dumbledore be true? We know that Albus Dumbledore was born in 1881, that his mother Kendra Dumbledore died in 1900 and that his father Percival Dumblefore was in Azkaban since the attack on Arianna. I'm struggling to see how this makes sense. Is it even possible, given what we currently know? It can’t be - Dumbledore’s parents died too long before his birth. Dumbledore’s parents both died before they could possibly have another child Credence’s age. When he was hunting Hallows with Grindelwald, the reason that Dumbledore was so interested in the Resurrection Stone was to bring his parents back so he’d be free of responsibility to Ariana. Since he wanted to bring both of his parents back, his father would have already died in Azkaban by then - the Resurrection Stone is said to bring people back from the dead, not free them from Azkaban. If he thought that the Stone would bring back his father, his father would have to be dead. His mother was also dead, because her death was why Albus became responsible for Ariana. She died when Albus was around eighteen - he’d recently graduated and was close to leaving for his traditional post-graduation tour of the world before she’d died. He was around seventeen when he met Grindelwald, which would be when he sought the Hallows. He’d only spent two months planning with Grindelwald, so he wouldn’t have aged much in that time. 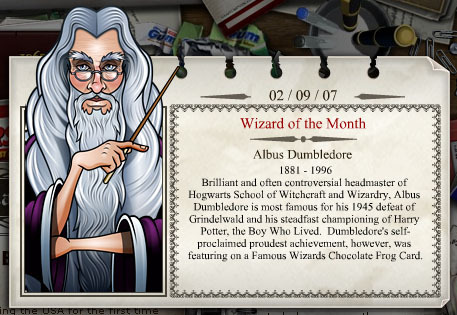 Dumbledore’s birth year was stated to be 1881 on his Wizard of the Month card, which was written by J.K. Rowling and featured as part of her old website. Dumbledore’s parents would have to have both been dead by 1899, since he couldn’t have been more than eighteen when he was hoping to bring them both back with the Resurrection Stone. This would mean neither of them could possibly be Credence’s parent. Credence was able to be confused with another baby, Corvus Lestrange, who was born in 1901, so he’d likely have to have been born around then as well. Dumbledore’s parents would already have been dead then, for sufficiently long that his father couldn’t have conceived Credence before dying, even with another woman, if he somehow escaped from Azkaban, and his mother couldn’t have died while having Credence. They would have been dead around two years before Credence was born, so they wouldn’t have been able to have him even right before dying. We reenter the story to find LESTRANGE SR. with a new, blond wife. He remarried not three months after her death. He loved her no more than he had loved you . . . But then . . .
IRMA takes the BABY BOY who has just been born, and passes him to LESTRANGE SR., who is delighted.
. . . his son, Corvus, was born at last. And that man who had never known love was filled with it . . . In Fantastic Beasts: The Crimes of Grindelwald, it seems that Dumbledore’s birth year is fairly consistent with this - he’s forty-five in 1927. Simply subtracting his age from the year gives 1882, but if his birthday is still yet to come at that time, it may still be 1881. Presuming that the events occurred at the same time in Dumbledore’s lifetime in the movies as in the books, his parents would still be dead too long to have Credence in the movies’ timeline. Apparating beside a dandyesque forty-five-year-old wizard with graying auburn hair and beard. NEWT hands back his glove. So no, it isn’t possible by previously established canon that Credence could be either Dumbledore’s full brother or half brother, since his parents both had died before Credence was born. However, as Valorum says in the comments, JKR has already broken canon for the movies, so this doesn’t mean that it’s not going to be shown as true in the next movies - she may simply ignore the dates that were established for Dumbledore’s family, like she did when she de-aged him down from 150. Maybe it’s not, we don’t know if what Grindelwald said is true yet. Credence being Dumbledore’s brother isn’t truly confirmed yet - Grindelwald says he is, but it’s also clear that Grindelwald is willing to lie to people and manipulate them to get them to join him. He caters his approach to each person, like telling Queenie they’ll build a world where she can marry Jacob. He knows Credence is desperate for family, and he’s certainly playing the long con. So . . . Credence Barebone. Nearly destroyed by the woman who raised him. Yet now he seeks the mother who bore him. He’s desperate for family. He’s desperate for love. He’s the key to our victory. Grindelwald specifically wants Credence to find out his heritage from him (killing off Irma to ensure it), and he lays out a path for it to happen, so Credence will be led right to him to learn his heritage. Grindelwald specifically wants Credence to kill Dumbledore, so there’s a clear reason he’d want to make Credence to hate Dumbledore. Portraying him as the brother who abandoned Credence would be a good way to turn him towards Grindelwald and against Dumbledore. There’s no reason to presume that Grindelwald is telling the truth yet without further confirmation. Even the phoenix may not be what it seems - Grindelwald is extremely talented in Transfiguration. In addition, Credence only was seen with the chick after he encountered at least one person who was confirmed to be working for Grindelwald - Grimmson, who killed Irma for Grindelwald to further his plan to lure and recruit Credence. He, or another one of Grindelwald’s followers, could have put the chick on or near him for him to find. It could even be a real phoenix - Grindelwald would have known both his own plan to turn Credence to his side against Dumbledore and the legend about the Dumbledore family’s phoenix connection, so could have arranged to get a phoenix, they’re rare but not impossible to find. There’s no reason to think Grindelwald is telling the truth yet. If he really is telling the truth, it’s likely to be confirmed in later movies, but for now it’s early to think Credence is actually Dumbledore’s long-lost brother - he still might not be. Personally I do not think Grindelwald was lying to Credence as Phoenix confirm that Credence is a Dumbledore. It is possible in several ways. It is true that Dumbledore's parents are known to be dead by the time Credence was born and, as Bellatrix nicely showed in her quote, Albus himself thought they were both dead. But while we can safely accept Kendra was dead for sure as there were witnesses and funerals and all, the only thing we know about Percival Dumbledore is that he died in Azkaban. No details. I mean, same way as we knew Crouch Jr died in Azkaban? Same way as we knew Peter Pettigrew was dead? You see what I mean? It is totally possible in JKR's world that Percival survived and even Albus didn't know that. Not his mother. If Honoria was his mother, who is this new aunt then? How many aunts does Albus have? Though if Credence is son of Percival (see previous theory), then this is the same aunt Honoria we already know about. Which makes sense if she is Percivals' sister helping his child. First of all there are lots of theories about this out there - none of them are mine. But I think the general idea is valid, so will mention it here. I know this: an Obscurus grows in the absence of love as a dark twin, an only friend. "Entity" is a strange choice of words here. May be just a coincidence or refer to the fact that Credence is not a human being. This theory though does not explain why and how Credence got his name Aurelius Dumbledore (if the surname is not Grindelwald's liberal addition). I don’t think Credence is Albus, Aberforth, or Ariana’s full or half brother. I think he could be a Dumbledore, just from a difference branch of the family. The Harry Potter nerd in me had the math worked out by the time I walked out of the theater. With Credence’s youth and the dates of Dumbledore’s mothers death, his father life imprisonment and obvious death before Kendra’s, then there’s no way he can be there brother. Furthermore, Aberforth loved his younger sister, if he knew he had a brother he’d have made sure to be oarr of their lives. And Dumbledore would have mentioned it in The Dealthy Hallows in Harry’s vision in Kong’s Cross. But the best evidence is the time just doesn’t make sense. I do think Grindelwald tracked down Dumbledore’s Great Grandfathers former Phoenix (Fawkes) to lie to Credence. He might be a Dumbledore but he’s not a sibling of Albus’s, at most he’s a cousin or even more distantly related. Somehow I think Dumbledore helps Credence find his true family, and somehow wins Fawkes loytaly in the process. There just no way he’s the 4th, unknown about til now, Dumbledore sibling unless Kendra and and Percival returned from the dead, conceived him and then died again. Not the answer you're looking for? Browse other questions tagged harry-potter fantastic-beasts the-crimes-of-grindelwald or ask your own question. How Did Merope Gaunt Procure a Love Potion? How does the diary prove Voldemort is the Heir of Slytherin?